Bvlgari Aqva Pour Homme and Aqva Pour Homme Marine, both created by perfumer Jacques Cavallier, are classified as aromatic aquatic fragrances, “designed to evoke the natural freshness and vitality of the ocean.” We’ve all encountered fragrances or perfume notes that claim to capture the scents of clouds, sun, snow, mountain air, deserts, or beaches. I admit to being susceptible to such perfumes because my imagination can ‘fill in the blanks.’ If a perfumer presents me with “Snow” (or more likely, La Neige) — she can bottle some pine needle and cedar wood oils, incense/smoke notes, and a “cold, damp mineral” accord and I will create a snow scene in my mind (a snug cabin, or chalet, located in wintry mountains, its lopsided chimney releasing swirls of sweet wood smoke that creates a lavender-colored haze around snow-capped evergreen trees and boulders) that can accommodate her perfume idea. But that scene doesn’t really smell of actual snow (ice crystals) does it? Imagine the perfume possibilities when trying to re-create the smell of water. 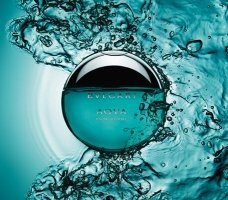 Bvlgari has limited itself (somewhat) to re-creating the scent of the “ocean”/“sea” in its Aqva fragrances for men — and since I live in the Puget Sound region and grew up within sniffing distance of the Atlantic Ocean and the Chesapeake Bay, I feel ‘qualified‘ to judge its efforts. “My inspiration for Aqva Pour Homme came from deep water,” said Cavallier. To evoke the smell of the deep sea, he used notes of mandarin, petitgrain, santolina, posidonia, mineral amber and clary sage. I have a friend who loves all ozonic, marine, and ‘fresh’ scents, so last summer when I was given two large sample vials of Bvlgari Aqva Pour Homme, I gave him one of the samples and asked him to let me know what he thought of the fragrance. “It smells nasty,” he said. I made a note to try Aqva Pour Homme immediately; at least I knew it was not your run-of-the-mill ozonic/marine/fresh cologne (sorry, Friend, but we have talked of your perfume tastes face to face). Aqva Pour Homme begins with strong mandarin and petitgrain aromas — a welcome change from the usual bergamot opening one gets in many mainstream men’s fragrances. Within minutes, the citrus notes fade away and an herbal aroma comes to the fore. Posidonia, an aquatic plant that grows profusely in Mediterranean and Australian waters, is a fragrance note in both Bvlgari Aqva perfumes. I’ve never smelled this fragrance note in isolation but I believe it accounts for a light, clean, slightly salty and “reedy” aroma in both Aqva scents. But posidonia cannot compete with Aqva Pour Homme’s pungent santolina note. To me, santolina leaves smell of petroleum; I always imagine a murky, dark green, molasses-like substance when I get a whiff of strong santolina, and I like the scent. Aqva Pour Homme has an aquatic character, but it does not smell like ocean water. When I wear this fragrance, my imagination, once again, takes over and I’m at the shore where one smells damp, barnacled pilings and moorings; tarred wharves; seaweed; and warm oceanic breezes that are scented with the aromas of hot boat engines and their sweet-smelling exhaust fumes. In fact, the scent of Aqva Pour Homme reminds me of the Seattle Ferry Terminal! If you dislike the “gasoline,” or “dried tar” fragrance note in Christian Dior Fahrenheit, I wager you will NOT like Aqva Pour Homme. The santolina/posidonia accord starts off rather smoothly but quickly intensifies. At the very end of Aqva Pour Homme’s development I smell faint, dry/chalky amber. Aqva Pour Homme is a rather stark fragrance and it lasts on my skin for three hours or so (which is a good thing; I like the santolina/fuel oil note but don’t think I would want to smell it for much longer than three hours). Aqva Pour Homme Marine contains notes of neroli bigarade, grapefruit, posidonia, sap, rosemary flower, and white cedar wood. 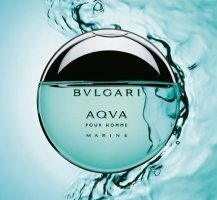 A Bvlgari rep’s quote in Cosmetics International regarding Aqva Pour Homme Marine made me frown: It will definitely appeal to younger men and women, especially in Asia" (11/2/07). We all know what young men and women like: “fresh” and “clean” and rather “simple” fragrances (I’m generalizing, of course) and it is constantly mentioned in perfume news that many Asian perfume customers don’t like to smell of “perfume” at all — they appreciate fragrances that are barely noticeable. Aqva Pour Homme Marine opens with a tangy, slightly “dirty” grapefruit note that, unfortunately, disappears within seconds on my skin. The almost-non-existent citrus opening leads to a mild “marine” (posidonia) accord. The marine accord blends with a sweet, nondescript, slightly “minty” accord that contains a hint of faded cedar. Aqva Pour Homme Marine is a nonentity compared with “original” Aqva Pour Homme. On my skin, the well-blended Aqva Pour Homme Marine smells like a single perfume accord that I’d call FRESH (fill in the blanks): AIR? WATER? LAUNDRY? Even my active imagination could not build a back story for this dull concoction. Neither of the Aqva Pour Homme fragrances is groundbreaking (or should I say ‘wave-making’), but original Aqva Pour Homme has more character and “spirit” than Aqva Pour Homme Marine. Once more, the flanker is outdone by its antecedent. Marine is VERY watery in one regard: its lasting power on my skin is 15-30 minutes — tops.“For Aqva Pour Homme Marine, I thought of the color and transparency of crystalline water,” said Cavallier. After reading that quote and smelling Aqva Pour Homme Marine, I can honestly say Cavallier produced a scent that matches his, or Bvlgari’s, inspiration. My 2007 winner for blandest men’s fragrance release went to Kenzo Tokyo; so far in 2008 (the year IS young) Aqva Pour Homme Marine takes that prize. Note: top image via Parfum de Pub. Nice review, K. I ordered two Bvlgari minis last year — Blv Homme & Homme Soir — but skipped Aqva because I thought it would be boring. Now I'm curious. Your description of santolina reminds me of the coast here in Santa Barbara, where natural oil seepage results in bits of tar washing up on the beach and now and then resulting in a noticeable tar odor mingling in the sea breeze. Not necessarily a *nice* smell, but very evocative. Aqva almost sounds interesting. I may need to spritz next time I'm in a department store. I have to say I don't really care much for either Blv Homme or Homme Soir. Both have a somewhat generic “mass market” feeling about them, and when I recently sniffed Omnia Amethyste, I realized I sensed in it a very similar “synthetic” accord that I recognized from the other Bvlgaris. I told Robin that I refer to this note now as the signature “Bvlgarity”, since I find it extremely unappealing. As for bland fragrances: really, who needs them? Just get yourself an unobtrusive shower gel and save some money. I've learned from bitter experience that I'm not going to like anything named “Aqua”. This doesn't apply to Guerlain's Aqua Allegoria scents; I mean things that are actually called “Aqua”: the two Bulgaris, Rochas Aquaman, Miracle Homme Aquatonic, Acqua di Gio Pour Homme, Aqua Quorum….They're just all the same, all hideously boring. Okay, I do actually like CSP Aqua Motu. But only that one. Hi! I usually run from Aqua scents too…and things in blue bottles! I've never tried Aqua Motu…. Kevin, I think that Bulgari has good products but their fragrances are always a bit on the 'boring' side of life – I mean never too crazy, never too daring, never a bit over the top challenging. Admit that I have never smelled these fragrances but it is just my impression. E.g. I once bought Bulgari's Rose Essentielle but after a while I started to miss something: either the thorns of the roses or the sexiness of the roses. A rose is not a daisy..
Did you know that the smell of sea water is caused in large part by detritus (dead and decaying plant and animal matter)? Sea carrion sure smells better than land carrion. Great review. I will have to try Aqua Pour Homme because I really like the smell of the Seattle ferry terminal. If it could evoke seagulls catching french fries in mid air that would really be something. Kevin wonder if roses have always been kind of 'scentless' or that they have been manipulated. Or maybe it is just our noses? Recently I received a sample Roses Musk by Montale and then I thought by myself “this is how roses are supposed to smell!” Great fragrance! Maybe Montale could do a better job in creating some acqua scents for men..
eshellmoyer: maybe you should contact Demeter or CBIHatePerfume and reqest a french fry-seagull feather accord? Then you could layer it with AQVA Pour Homme? Marianne: I know many people who favor the LOOK/form of a rose to its scent — THOSE PEOPLE I will never understand! Give me a floppy, sloppy, floozy rose with strong scent any day over a rose that will keep its FORM for two weeks in a vase. Both of these fragrances leave me in ecstasy. I have a great number of women's fragrances but I prefer to wear men's aquatics. Aqua Pour Homme is salty and last and lasts. Marine is lighter and would do for summer daytime. Love, love, love them both! Kevin, thanks for your review. I was given a bottle of Bvlgari Aqua Pour Homme, and passed it off to my stepson. Thankfully, it's still on his bureau so I grabbed it and sprayed. The saltiness comes right through, tempered by the mandarin. I'm not getting the tar yet, but it's still early. Having grown up in Boston Harbor, I love the smell of warm tar on deck, mingling with airplane fuel and carrion lol. ….Update: now the tar is coming out, wish it were a little blacker, a little warmer. Well, my stepson is going to smell fantastic nextt time he wears it. Celestia: Have you tried layering the scents? If so, let me know how they smell together…and if you have not: DO IT NOW! HA! I'm not an “marine” fan in general, but I love the original Aqva. It's richer and a little more eccentric than most marine scents out there. Haven't tried the new one, so can't comment on it. I admire the house of Bvlgari in general – no, their scents aren't groundbreaking, but they have carved out a nice little niche for themselves. When my nose needs a break from my usual spicy orientals, I reach for Aqva or one from the tea series (Rouge being my favorite). CBG: thanks…and the tea scents are my favorite from the line too. I don't know, it kind of defies logic, but I do think snow itself has a smell or at least the air does. I can always smell snow before it happens, same as a thunderstorm. Maybe it's an ozone thing? And most water does have a scent – you could easily tell cups of seawater, lakewater and our (highly clorinated) tap water apart. Anyway, I'm one of those that really likes marine scents. They work well with my chemistry and I just have a lot of happy memories wrapped up in the beach. I'd love to try this, it sounds like an unusual one, they don't usually have a lot of depth. *For anyone who likes the salt tang of Aqua Motu – please try Demeter's Salt Air, it is very similar and longer lasting! Hi, Rose: that's mention no. 2 for Aqua Motu…must try it…and have never seen the Salt Air either. I wish there was some snow nearby I could smell…but this is Seattle. I certainly know what you mean though…the air smells so great right before a snowfall…and no ozone scent comes close to duplicating it. that would be really hillarious. Demeter really should make french fry. It would be more traditionally perfume-y than their lobster scent I'm sure. Thanks Existentialist, will read it. What I remember is that some roses kind of growing in the wild do have a stronger smell. Those roses that are not that popular and that grow over fences and against walls. I had been wondering whether roses really smelled more intense some centuries ago. This might be old stories to some but I love roses and maybe some find this interesting… Wild roses just look like oversized apple blossoms (botanically the same family). It is true that some roses that have a strong, spicy scent are rather simple shaped (compared to modern roses) bushy shrubs with short lived flowers (e.g. Rosa rugosa varieties), or look somehow tousled and dishevelled (and wonderfully so!) compared to modern varieties. The old Damask roses, which are used in perfume industries, only bloom once a year though lavishly. The later Portland and Bourbon Roses, which our great-grandparents grew in their gardens, had a second bloom in late summer. When these so-called “Remontant” roses were introduced in the second half of the 19th century most of them also carryied wonderful scent. But later the breeders concentrated more on a perfect shape and robustness of the flowers and ignored the scent as a quality. For example do most of the first modern “Hybrid Teas”, the new type of rose with especially large, single flowers on long stems have a rather weak or no scent at all. Most Floribunda Roses, a crossbreed between Hybrid Teas and the wild species Rosa multiflora are completely lacking a scent, but became popular because of the extravagant amount of robust flowers and the elegant blossom shape of the Hybrid Teas, that most people nowadays think of as the quintessential rose. That's why they drove the old fragrant roses out of our gardens. Many new rose varieties are trying to combine the two qualities shape/size and scent. But as far as I know only few of them can compete with the rich fragrance of such old varieties as “Reine des Centfeuilles”, “Fantin Latour”, “Blanc de Vibert” or “Boule de Neige” (all 19th century) or the soapy-spicy “Rose de Resht, first brought to Europe from Persia in the 1940s. Sorry, it's late and I got carried away a bit. Why do I write about roses in a Bulgari Aqua review…? I like many of Bvlgari's ladies fragrances so I gave this to my husband unsniffed about a year ago. I thought they usually make a good product, it couldn't be too bad. He wears Aqva to work despite the fact that he tells me it is “generic” and a fragrance produced for the masses. I think he is turned off by the whole Aqva aspect, thinking he'll smell like Cool Water Cologne since the packaging of Aqva seems so “blue” and ozone. With the initial spritz I agree with him, the citrus seems mundane and predictable. I think OK it's clean, nice,and at least it isn't Zest fully clean-ish. But, when he comes home from work, he smells so nice. The fragrance has dried down. It smells like petrol. It's dirty, gritty but still maintains to be “fresh” and green. My husband wears Dior Fahrenheit religiously because he likes the “oily, musty garage” smell in his words. My sense of smell is better trained than his, even thought we debate this frequently. I've told him Aqva was like Fahrenheit, but of course he didn't believe me and thought I was nuts. Or just trying to get him to use up the Bvlgari purchase that I made so that he can go back to wearing his beloved Dior, patchouli oil or amber resin again. Anyways, I had him read this so he wouldn't think my nose was “off” and that he has won the fragrance sensitivity battle. Today, he he tried Aqva again and had a fragrance epiphany or maybe it was just peer pressure. He “smells” the grit now. But, I think maybe he likes it now because you compared it to the Seattle Ferry Terminal. We loved that place so much we're relocating to the area this summer and he just needs a scent to remind of us of why we're moving across the country. I am so happy that you wrote this Lars. I knew that once roses must have smelled really good but have begun to doubt myself since all the roses one can buy hardly smell like anything. Hope there will be a great comeback of the original ones. Noticed that in gardens roses that are not so full and lush in shape but indeed more like a blossom, do still smell nice. Had no idea that they were related to apple blossoms. victoriamegatron: let me be the first to offer you a “PRE-welcome” to the Northwest. It's ALWAYS gratifying when an opinion or hunch is backed up by someone else isn't it? HA! Victoriamegatron: PS: I meant to also say what happened to your husband happens to me and every perfume person I know: we can wear a scent for a year and one day realize something NEW about it we just can't believe we didn't notice long long before. Noses are weird things. Thanks marianne… there are new breeds which smell nice but I'm so romantic that I prefer the old ones… By the way, apples, pears, plums, almonds, peaches, cherries, straw-, rasp- & blackerries… all the same family as roses: “Rosacaea”. If you look at the flowers you see they are quite similar. Kevin, sometimes if I come across an inspiring comment I tend to drift off a bit… I had to do with historical roses on a professional level, I'm not a rose specialist though. I don't grow roses as I'm always been too much of a nomad to have a garden, but hearing of your Mme Ernest Calvat makes me jealous! At some stage of my life I will definitely have a garden. It's so interesting to read how the roses came to their names. It's like history coming alive. Marine smelt so odorous and synthetic it was just too much. Smelt like cheap disinfectant. I’ve just been reviewing these two in my store, and find them quietly distracting in a feel good escapist way. I found my blanks filled came up as Ancient Grecian beach resort with ladies wearing leather bikinis for Marine, while Aqua itself made for a darker feel of late afternoon, drying off from such marine frolicks and getting back to the Senate to discuss the troublesome Vesuvius concerning my fellow Pompeiians. I’m disappointed about the Aqva Marine review here, although you’re spot-on about how long it lasts on the skin. I love the IDEA of aquatic scents (or, in this case, aqvatic) – but most of them come off as wan, overly-clean numbers. But I really enjoy both of these fragrances. For me, aquatic scents have to have a tang of salt to them, or the illusion of it, and the Marine does. Too bad it doesn’t stay on that long.